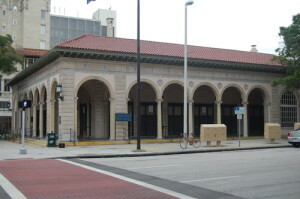 Dedicated in 1916, the St. Petersburg Open Air Post Office was the first open-air post office in the United States and has remained in continuous operation. The Mediterranean Revival building features ornamental archways, fine-detailed metal work, terra cotta piers and a Spanish tile roof. It was listed on the National Register of Historic Places in 1975. Originally called the Vinoy Park Hotel when construction started in 1925, the Vinoy Renaissance is also a Mediterranean Revival structure. After construction was finished on the 375-room hotel in less than 10 months in time for its debut on New Year’s Eve 1925, the Vinoy emerged as one of the nation’s most prestigious getaways for the affluent families, Hollywood A-listers, presidents and other celebrities. At one point, the property was used as a housing and training center for military cooks and bakers, and it even stood unoccupied for 18 years before undergoing a $93 million reconstruction in 1990. Restored to its original splendor, it earned a National Register of Historic Places designation and still stands as a jewel on downtown St. Petersburg’s waterfront. Renowned architect Yann Weymouth, who worked with I.M Pei on the Louvre’s glass pyramid, created the design as a tribute to Dalí’s free-flowing imagination. The downtown icon is enlivened with 18-inch thick concrete walls that compose the 66,000-square-foot building. The seemingly fluid glass portion called “The Enigma” wraps around the building like one of Dali’s melting clocks. Inside, the Helical Staircase spirals from the ground to the third floor galleries. The captivating venue showcases the work of Dalí, including a 2,000-piece permanent collection with oil paintings, sculptures, sketches, prints, photographs and other objects of art. Estelia Mesimer and her team at Keller Williams Realty in St. Petersburg embrace the culture of their city. Their office is located across from the Museum of Fine Arts, and they have a myriad of listings of high-end homes that are in the St. Petersburg area and a short distance from the cultural attractions. For more information on Estelia Mesimer and her team, and to learn more about the high-end homes she represents, visit www.estelia.com. You can reach Estelia at (727) 686-2859 and at estelia@estelia.com. Her office is located in downtown St. Petersburg at 111 2nd Ave. NE, Suite 400.